Last month, I was looking for fun game to play during an upcoming business trip. A game that would not require an internet connection to work (sorry Oz: Broken Kingdom) since I was going to be on an airplane. Browsing through the recent additions to the App Store, ‘Jade Empire: Special Edition’ stood out. Being a port of the game BioWare developed right after the original ‘Knights of the Old Republic’ really peeked my interest. So did the comments regarding its more action oriented combat, and its classic martial arts inspired story and setting. The $10 price tag was a tough sell, but I decided to take the plunge and give it a fair try. As a little background, I have not played many of the more complex mobile games; especially the more action oriented ones that attempt to replicate console or standard handheld experiences only using a touch screen. I do have a bit of experience with Infinity Blade and other similar titles where players usually swipe to slash and tap the screen edge to dodge. These are very fun but usually leave me feeling wanting more content in between combat sequences; ‘Horn’ being one of the few exceptions. The first detail that jumped at me about ‘Jade Empire: Special Edition’ were the graphics. It is an HD port of the original Xbox game so, although very nice to look at, the visuals are obviously dated; lacking some of the more modern light and shading. For the purposes of the game though, I had no issue. Note that the game does use pre-rendered movies frequently for important moments and the jump from the new high definition to the older more grainy pre-rendered movies is VERY noticeable. Again, it did not deter me from the experience too much. You can say it gives the game charm. Fame-rates were solid on my iPhone 7, which was very nice during the combat sequences. 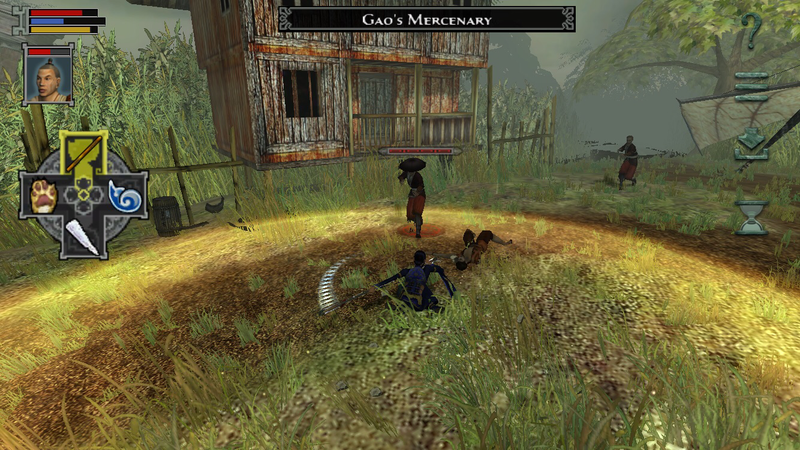 Main character performing a weapon style AoE attack. On to the combat, arguably one of the star features of this game. It is fun, interesting and challenging. It became clear very quickly why the original game had so many good reviews. The combat system rewards strategy and timing over mindless button mashing (screen tapping in this case). You can sometimes feel a little “all mighty” against a single opponent but, more often than not, the game seems to pin you against groups of enemies which keeps it difficult. Maintaining battle awareness is essential as groups of enemies are always trying to surround the main character. I became used to doing a lot of dodging around vying for position. Then, when an opening would show, I unleashed enfeebling attacks to apply slow or freeze status before closing in to eliminate a specific enemy. After, I would resume my dodging, looking for the next good target to repeat the strategy. Paying attention to the enemies’ actions will also help. If an enemy is blocking, the player has to either move on to a different target or perform a heavy attack on the blocking opponent to break his or her guard. On paper, it sounds very formulaic, but the execution and subsequent victories have felt very satisfying and exciting. About the difficulty: Even in the normal setting (which I usually avoid in games), the combat was very challenging. Part of it I will blame on the touch control scheme. I feel that, if the controls allowed me to be more “reactive”, it would have been much easier, probably encouraging me to bump up the difficulty. So, in the maybe 6 hours of playtime I have dedicated to the game, I found at least two encounters where I kept dying over and over. In the end, I endured, but not without being severely tempted to throw my phone to the floor and stomping on it. Talking about touch controls, the iOS version has two control schemes and it is worth talking about them. The standard (default) controls follow the common convention of using a virtual analog stick on the left side of the screen while having touchable icons for different actions on the right side of the screen. I did not even bother with this setup as I worried I would miss the icons and, more often than not, do the wrong thing, or nothing at all during combat. I prefer to keep my eyes on the action, not on the bottom right corner of the screen. On one of the reviews I read before making the purchase, someone had mentioned “gesture based controls” so I quickly sifted through the settings to find what the game calls “Expert Controls”. These remove most of the right side icon buttons and replaces all of their actions with gestures; mostly swipes. They work really well although they do take a little practice getting used to. Tap for basic Attack. | Swipe up for Power Attack. | Swipe right to do your Area Attack. | Tap and hold for Block. | Swipe down to Heal. | Swipe left to perform a Chi Strike. These controls allowed me to focus on the action. They also allowed me to, more often than not, use the right ability at the right time. It is not error-proof by any stretch and, if you frantically swipe the screen, pretty much nothing will happen. I found that, as long as I kept my cool during battle and calmly used my attacks, everything would work as intended. I have only played the game for about six hours and have kept pretty much to what is probably the initial, introductory, portion of the game. The story, so far, has been pretty engaging. The characters are a little dry and archetypal but, being inspired by martial arts movie, it works. There is voice acting everywhere! A good thing since, most of the time that you are not fighting, you are having conversations with primary characters or random NPC’s. 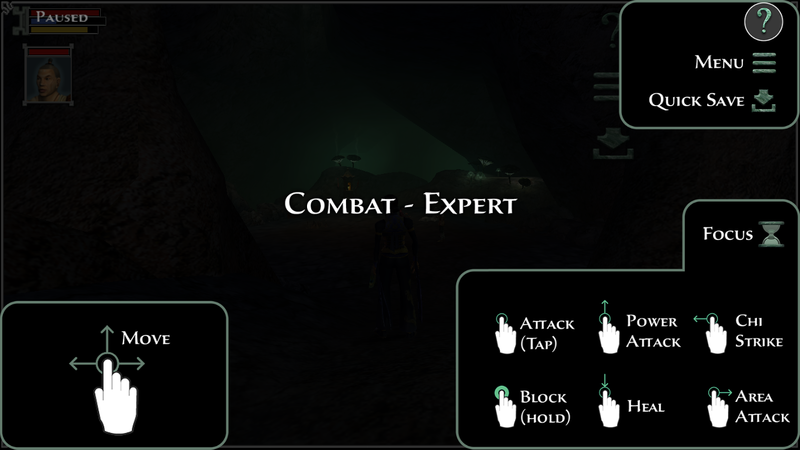 The game supports plenty of dialog choices and, certain decisions will affect what side of the spectrum your character leans towards; much like the use of Dark Side and Light Side in ‘Knights of the Old Republic”. The game supports saving and quick-saving pretty much everywhere which I recommend players do often. This will protect them from botching a battle and being forced to retrace five to ten minutes of gameplay. Yes, whenever the player is knocked out, the only option is to load from one a previous save. I also recommend saving often in case the player screws up a conversation and ends up with an undesired result on their good/evil spectrum. The game supports uploading a save to the cloud. This allows players to play the same file across multiple iOS devices. System settings are not saved as part of the cloud save so make sure to set those up before encountering your first battle on a new device and having the wrong control scheme selected. Happened to me. It as terrible. Saves and quick-saves are not the only mobile friendly feature in ‘Jade Empire: Special Edition’. The game also loads and is ready to go quickly. There are loading screens but they usually pass faster than you have time to admire their lower resolution image. I was able to pick up the game and drop it off consistently throughout my business trip without missing a beat, which is exactly what I was looking for. 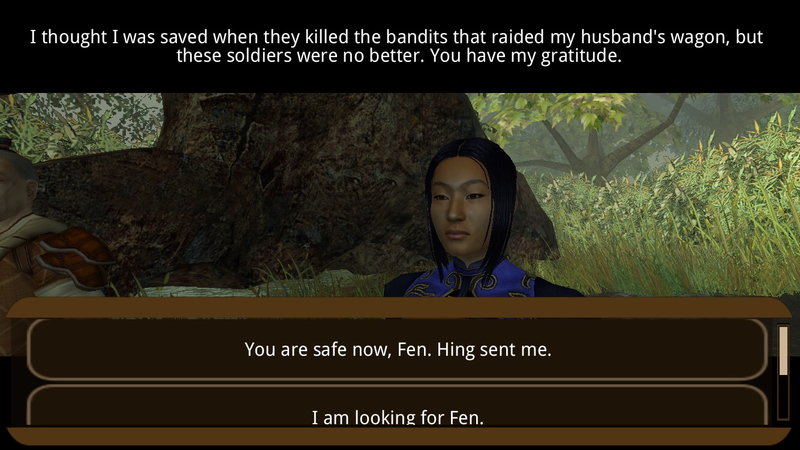 Another great feature ‘Jade Empire: Special Edition’ has is a quest log. Many games from its time did not have quest logs so we appreciate BioWare’s thoughtfulness. This feature further enables the player to put down the game and pick it back up in short spurts as you can always check the quest log to refresh your memory on where you are and what you might need to go do next. I have really enjoyed my time playing ‘Jade Empire: Special Edition’. The story, voice acting and environments are still entertaining for a game that came out more than ten years ago. The graphics, although enhanced for HD, could have a used a little more refinement. The “Expert Controls” do a great job of making the game accessible on a touch-only device but are far from perfect or precise; only seeming to work when the player is calm and can premeditate every action they are going to do. The moment the player is forced to react too much, the controls tend to fall apart. Other reviews have mentioned the use of a compatible gaming controller and this would probably completely fix the control issues. Details that improve the experience on mobile platforms are there such as ease of saving, quick load times and an active quest log. The combat is challenging but fun. The proposition of spending $10 on an App Store title is very daunting. I have spent plenty more on handheld titles and console downloads but, for some reason, it just feels odd paying that much for a “phone game”. Regardless, I took the leap and gave the game a shot. Bottom line: If you are looking for a thorough Action RPG of BioWare caliber, ‘Jade Empire: Special Edition’ might be worth the price. With an average play through time of 26 hours, decent story and challenging combat system, it succeeds in delivering the “console experience” on a mobile platform.